Datasets comprised of satellite imagery, geo-location data, and social media data are just a few of a vast number of alternative data sources that have yet to undergo widespread adoption by the investment community. For example, when JCPenney announced better than expected earnings for Q2 2015, most investors were taken by surprise. A few hedge funds, however, were not surprised due to an obscure dataset of satellite imagery provided by RS metrics, which showed an increase in foot traffic in JCPenney parking lots. The hedge funds were able to make a 10% profit in two days all thanks to their access to an alternative dataset. Unlike RS metrics’ satellite imagery data, ESG data is available at no cost to anyone with a Bloomberg terminal. The growing dataset of environmental, social, and governance (ESG) data is one of these alternative methods that fund managers are turning towards in an effort to generate alpha for investors. Multiple studies have verified that in the long run, companies with sustainable business practices generate higher returns with lower volatility compared to the market as a whole. The “E” of ESG represents the ‘Environmental’ impact of a company including its carbon emissions, natural capital, renewable energy, and water stress. Next, the “S” stands for ‘Social’ and pertains to the data surrounding human capital, labor standards, privacy and data security, and stakeholder opposition. And finally, the “G” is short for ‘Governance’, taking into account data about the board, pay, corruption, and business ethics and fraud. Recent scandals such as Volkswagen’s violation of the Clean Air Act, Facebook’s data privacy issues with the Cambridge Analytica breach, and Wells Fargo’s account fraud are examples of how Environmental, Social and Governance can present themselves as portfolio risk, respectively. The Volkswagen emissions and cheating scandal, for example, resulted in the stock shedding nearly a quarter of its value. Why has ESG just recently become a consideration in portfolio construction? The emergence of quality ESG data sources is largely responsible for facilitating the increased adoption of this alternative data asset. 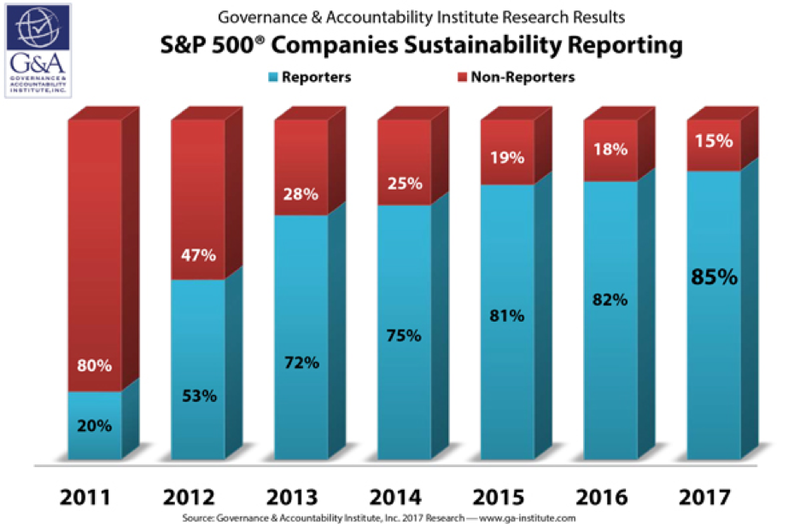 The percentage of corporations in the S&P 500 publishing sustainability reports has risen from just under 20% in 2011 to 85% in 2017. Similarly, across the Atlantic the European Union has mandated companies with over 500 employees to report certain ESG data. This deluge of information is being analyzed by investment research companies such as Thomson Reuters and Bloomberg, which produce sustainability datasets with actionable insights. With the increased availability of public ESG data, and coupled with fundamental analysis, ESG has emerged as a powerful tool for alpha generation. We are living in an era of unprecedented transparency – modern technology enables us to collect and analyze a massive amount of data, sustainability reporting is becoming the expectation rather than the exception, and social movements such as #metoo bring previously suppressed voices to the forefront. Now that we have the data and the technology, ESG investing is the data-driven way to invest in better run companies. Companies with the strongest track records on environmental sustainability and employee relations are more likely to have better long-term performance than those with the weakest records. Eccles, Robert, et al. “The Impact of Corporate Sustainability on Organizational Processes and Performance.” Harvard Business Review, 2014. Kresge, Naomi, and Richard Weiss. “Volkswagen Drops 23% After Admitting Diesel Emissions Cheat.” Bloomberg.com, Bloomberg, 21 Sept. 2015, www.bloomberg.com/news/articles/2015-09-21/volkswagen-drops-15-after-admitting-u-s-diesel-emissions-cheat. “Non-Financial Reporting.” European Commission - European Commission, 14 Dec. 2017, ec.europa.eu/info/business-economy-euro/company-reporting-and-auditing/company-reporting/non-financial-reporting_en. “2005 Catalyst Census of Women Board Directors of the Fortune 500.” Women in Management Review, vol. 21, no. 6, 2006, doi:10.1108/wimr.2006.05321fab.001. Zlotnicka, Eva, and Lin Lin. “A Framework for Gender Diversity in the Workplace.”Morganstanley.com, 31 Mar. 2016, linkback.morganstanley.com/web/sendlink/webapp/f/48lii6g4-3pfn-g001-a95b-005056013400?store=0&d=UwBSZXNlYXJjaF9NUwA0Y2JhNjRhYS1lYmFkLTExZTUtODkwZC01ODE5YTBmMGFjNDI%3D&user=dc5x8vusckszb-1&__gda__=1585560191_cef9ab0dce0d5c07e768b773fbe18ad1. Ekwurzel, B., et al. “The Rise in Global Atmospheric CO2, Surface Temperature, and Sea Level from Emissions Traced to Major Carbon Producers.” SpringerLink, Springer Netherlands, 7 Sept. 2017, link.springer.com/article/10.1007%2Fs10584-017-1978-0. Newer PostIs Current Employee Compensation Sustainable? Older PostIf You Hate Fox News Why Are They One of Your Investment Holdings?